Robert Luff & Co are delighted to offer this five bedroom detached house in sought after Goring Hall. The property has superb accommodation and is positioned with the beach at the bottom of the road. Local schools, shops and transport can be found nearby. There are many features including a good size west facing garden, three reception rooms, modern kitchen/breakfast room and utility room. The master bedroom has an en-suite bathroom and there is also a family bathroom. The property is being sold with no forward chain and Internal viewing is essential. Wood flooring, understairs storage cupboard, radiator, wall light points, wall mounted thermostat control unit for central heating, range of additional storage cupboards with shelving. Obscured double glazed window, close coupled low-level W.C. corner basin with cupboard, part tiled walls, wall light point. 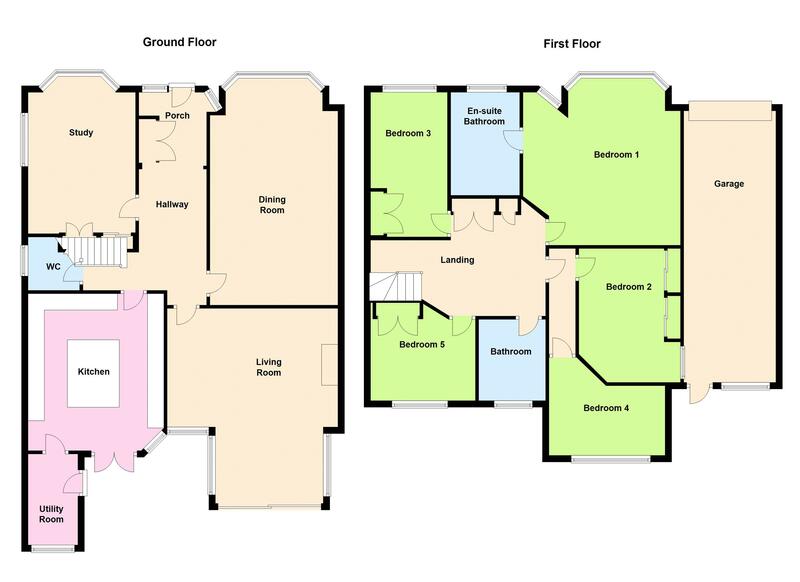 Narrowing to 3.61m (11'10") L-shaped room with feature fireplace, wall light points, range of double glazed windows, double glazed sliding doors onto rear garden, serving hatch, tv point, three radiators. Double glazed bay window, smooth and coved ceiling, two radiators, wall mounted feature fire, tv point. Two double glazed windows, wood flooring, range of drawers, desk, work surfaces, storage cupboards, washhand basin, storage cupboards with sliding doors. Measurements to include built-in wall units. Matching range of wall and base units with work top surfaces and one and a half drainer sink unit with mixer tap, under lighting, island with breakfast bar and cupboards, integrated fridge, freezer, double oven with hob, dishwasher and microwave, ceiling lighting, double glazed window and doors to rear garden. Double glazed door and window to rear garden, sink unit, plumbing and space for washing machine, space for tumble dryer, part tiled walls, wall mounted gas fired central heating boiler. Access to loft space, radiator, cupboards with storage shelving and hot water tank with slatted shleving over, double glazed obscured window. P shaped bath with screen and wall mounted shower, low level WC, tiled floor and walls, chrome ladder style towel rail, washhandbasin set into work surface with fitted drawers below, smooth ceiling with spotlights. Measurements to include built-in wardrobes with sliding doors, wood flooring, double glazed window, TV point. Measurements to include built in wardrobes. Wardrobes with hanging space and shelving, double glazed window, radiator, TV point. Measurements not to include built in wardrobes with part mirror fronted sliding doors, double glazed window, radiator, TV point, smoke detector. Measurements to include built in wardrobes with storage and hanging space, double glazed window, radiator. Corner bath with jacuzzi, corner shower unit with tiled walls and floor, heated towel rail, low level EC and pedestal washhandbasin with units and drawers below, fitted mirror, double glazed window. In-out driveway with shingle borders and flower and shrub borders to one-side. Mainly laid to lawn, large patio area at rear with two sheds for storage, flower and shrub borders, pond, hedging and shrubs, water tap, enclosed by panel fencing.